As part of the Illinois-National Taiwan University Global Issues Forum, the ACES Office of International Programs sponsored a seminar on vertical farming presented by Dr. Wei Fang. Dr. Fang is a professor in the Department of Bio-Industrial Mechatronics Engineering and Director of the Center of Excellence for Controlled Environment Agriculture at National Taiwan University. He has worked on vertical farming methods for nearly three decades. 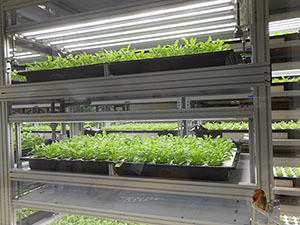 Vertical farming techniques, also known as plant factories with artificial lighting (PFAL), smart farms, urban farms, and by many other terms, are closed plant production systems that use artificial lighting and the least amount of resources possible. For many years he answered NO to this question. As detailed in the presentation, he had to wait many years for more advanced and affordable LED technology and for industries to accept and support these methods. But now, Fang says PFALs are a great option in areas where land is limited or very expensive and/or other resources are scarce. In Taiwan, this industry has grown exponentially. In 1993, one company was involved and by 2015, more than 100 companies are involved. The country has been able to increase its vegetable consumption per person/per day thanks to PFAL techniques. Besides edible vegetable production, Fang showed many other business models supported by vertical farming in his country, including for edible flowers, cosmetics and soaps, vegetable powders, and even interior design with vertical plant walls. He and others have done much work to improve vertical farming techniques and to quantify different techniques. YES – Vertical farming can make Taiwan (and hopefully other areas of the world) richer, smarter, greener, healthier, and happier.